It is possible that you will recall Magnard's name. You may well know of it and have heard the third symphony from a recording made by Decca in the 1960s when it was recorded by Ernest Ansermet with the Orchestre de la Suisse Romande. Then again during the 1970s the Toulouse Capitole Orchestra recorded all four works plus the Chant Funèbre for French EMI and these have been reissued on three CDs in recent years. The present discs are utter gems. Ossonce and the Hyperion treatment accorded to the BBC Scottish sweep the board. 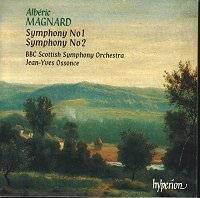 The recording are modern and the performances are fully the equal of Magnard's romantically impressionistic music. Both discs are available separately and if you can afford only one then buy the disc coupling the two later symphonies. The music moves gradually from Franck and D'Indy towards a new though hardly revolutionary impressionism. The first symphony opens in a densely decorated grandeur - all very Franckian. The second movement is ecclesiastical, deploying long and distinguished musical lines and rising to a bright and big treatment of the theme at 5:50 in Elgarian spirit. There is a notably fine trumpet solo. The third movement is a boisterous presto like the wild dance of a witches' coven. The finale is a Brahmsian molto allegro with exciting woodwind contributions, impassioned string playing and explosive lightning-strike contributions from the violins. It ends in regal brass work. The second symphony opens with a lively Ouverture. The second movement Danses is like a roundabout; musicbox bright and inspired with ideas darting and glistening. The third movement Chant Varie is Wagnerian and its silvery strings lend a real enchantment to the proceedings although this is the one movement where meandering descends into noodling and the attention drifts. The finale is a movement marked vif )(a favoured marking) where the spirit of Bizet's Arlesienne haunts the pages. It ends in further celebration and with startling pre-echoes of Janacek's Sinfonietta. 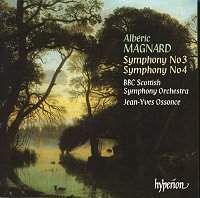 The third symphony may well be familiar from the Ansermet recording. As far as I am aware the Ansermet is not currently available but I do recall hearing it. Memory suggests a totally dedicated performance which may well, in interpretation, be the superior to Ossonce. In any event the recording will be no match for Hyperion. The Introduction is darkly choleric like a cave of the darkest dreams. The atmosphere is strong and the roof of the cave is decorated by the gentlest of strings with glowing lights. The second Danses (again tres vif) sets off at an explosive presto, scurrying and businesslike. The third movement sags somewhat, suffering from meandering which I take to be endemic to this movement as well as the similar movement in No. 2. The finale is life-enhancing, darting, energetic, flighty and emphatic with grand ideas. It is romantic and modern and at 5:10 an echoing figure for the strings counterpoints a gloomier figure on the brass in a passage of pure magic. The strings are often engaged in mysterious scampering redolent of Sibelius's string writing and after much silky-toned subtle work for the sensitive violins the work ends with Elgarian resolve. The final symphony opens with hot warm winds blowing up from the South like the Mistral. The temperature may be a couple of degrees cooler than the whistling Hadean winds of Francesca da Rimini. The vif second movement is stirringly colourful, strongly flavoured with the music of rural France, Canteloube's Auvergne and even a hint of the rustic Kodaly. Here it becomes apparent that Ossonce has split the violins, first and second, left and right rather as Boult customarily did. It makes for an excellent musical effect. I wish more conductors would do it. The Chant Varié is Rimskian with more echoing delicacy for the violins and the an evocation of the glistening grandeur of a cathedral roof far above us. The finale has a tendency towards heavy molasses but it ends in the most pellucid of textures with a calm unwinding return to the original theme and an ineffable sense of journey's done and symphonic satisfaction. The notes are in both cases generously long and informative. They are in English, French and German. There are no notes about the BBC Scottish (no great loss as we know about their silky strengths from other Hyperion releases) but it is mildly disappointing to go looking for information about Ossonce and find nothing at all. Ossonce is known to me from these two discs, Chabrier's incomplete opera Briseis and the piano concertos by Hahn and Massenet all on Hyperion and from a Naxos set of the Massenet suites. He also directed the BBC National Orchestral of Wales in a studio broadcast of Symphony No 1 by Dohnanyi. This was in 1995 before any commercial company had got around to doing a recording. Ossonce is a name and reputation to be watched. The notes are by the unfairly overlooked romantic composer Francis Pott whose strongly-structured Farewell to Hirta, a rewardingly romantic hour-long work for cello and piano, can be found on the Swiss Guild label GMCD7141. Design and technical values are up to Hyperion's usual high standards. well, we can hope perhaps for the similarly Southern Josef Marx's orchestral works of the 1920s especially the reputedly very fine Naturtrilogie and the Herbstsinfonie. Connoisseurs prepare for discoveries to come. For now do not overlook this fine release. It carries music that you will hear and remember to hear again.